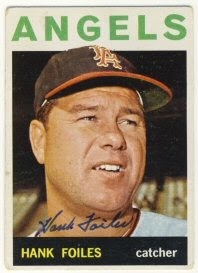 One return today. 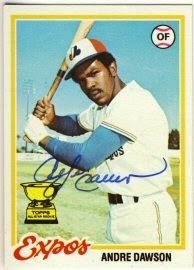 Andre Dawson signed his 1978 Topps with a small donation to his foundation. 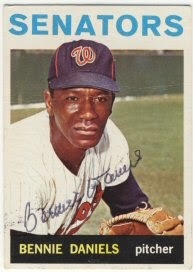 I'm still considering undertaking the 1978 Topps set as a project. 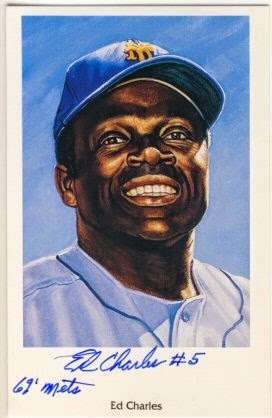 I have all the cards, but I like to send out two or three cards in a request, so I'll need to choose another set or two in the same time period and buy those sets as well. 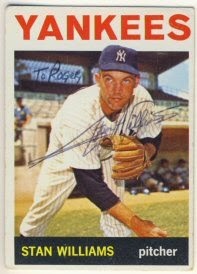 The 1977 Topps are nice, but they already have the facsimile signature on them so I'll probably avoid those. 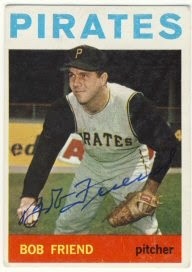 The 1979 set is nice, so I'll probably choose that one, and I have quite a few of those cards already. 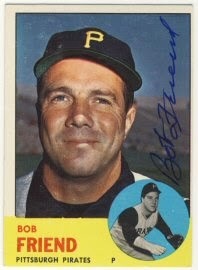 The 1976 set is nice too. Hmmmm. 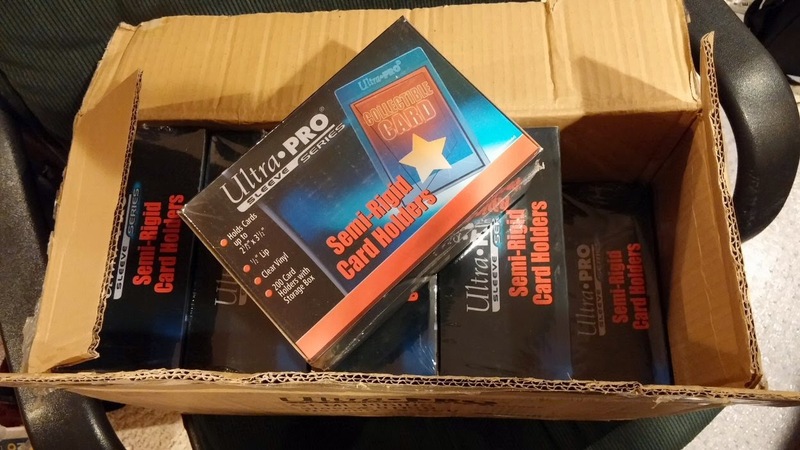 I also received a case of Ultra Pro semi rigid card holders that I ordered off eBay. 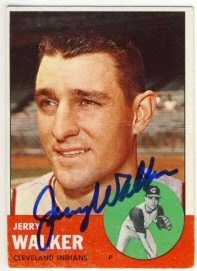 Ten packs of 200 holders. I last ordered these about four and a half years ago (http://droidtrader.blogspot.com/2010/02/supplies-have-arrived.html) so I shouldn't have to order them again for a while. 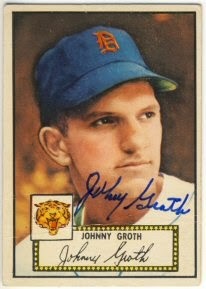 I received two returns today including a really nice 1952 Topps signed by Johnny Groth. 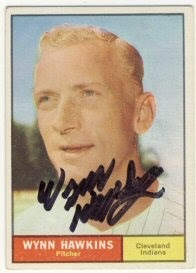 I love getting these older cards signed, but at $8-$12 per card, I don't send out too many. 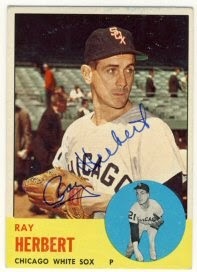 I also received a 1963 and 1964 Topps signed by Ray Herbert. 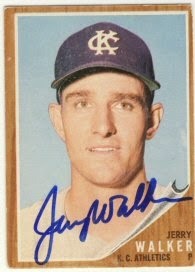 I was disappointed that the Royals lost game 7 of the World Series last night. I wanted to see some guys like Alex Gordon and Billy Butler win a World Series after playing for so many years on bad teams. 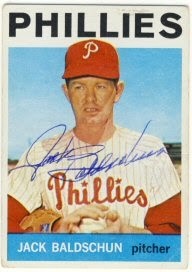 One more return today as Jack Baldschun signed his 1963 and 1964 Topps for me and also included a personalized photo for me. One return today. 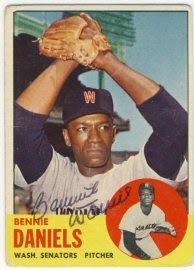 Bennie Daniels signed his 1959, 1963 and 1964 Topps for my collection. After I posted last night, I went to turn on the World Series only to realize it was a travel day. So, I had to wait until tonight. 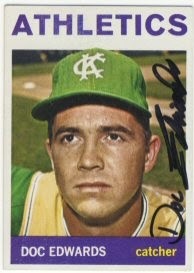 I'm hoping the Royals can send it to game 7. After a disappointing day at the mailbox on Saturday, I was pleased to find six returns waiting for me today. 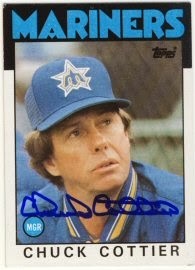 I really like getting cards signed by players that later became coaches and managers. 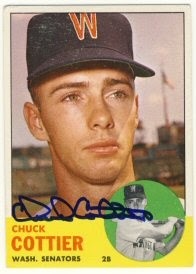 Chuck Cottier is such a player, who signed his 1963, 1964 and 1986 Topps. 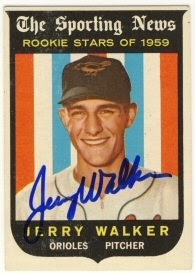 Jerry Walker signed his 1959, 1962, 1963 and 1964 Topps. 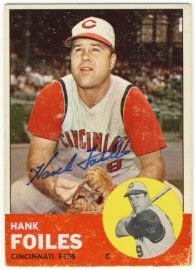 Hank Foiles signed his cards from 1963 and 1964. 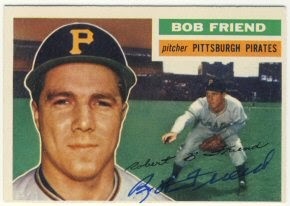 Bob Friend signed his 1956, 1963 and 1964 Topps. 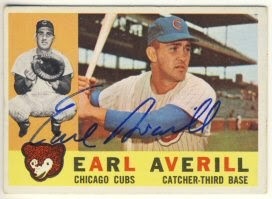 Earl Averill signed his 1960, 1962 and 1963 Topps. 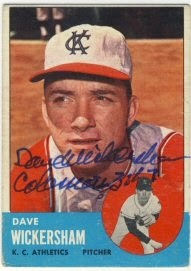 Finally, Dave Wickersham signed his 1963 and 1964 Topps for me. I need to wrap this up and watch game six of the World Series. 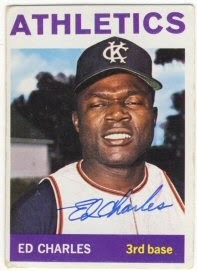 Go Royals!!! 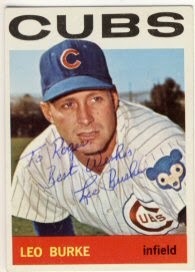 Leo Burke signed his 1964 Topps for my collection. I received two nice returns today. 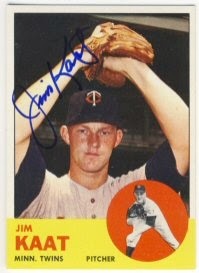 First, I received a 1963 Topps singed by Jm Kaat. 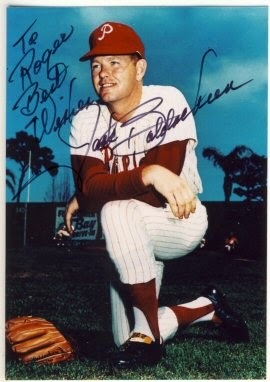 I sent this to a paid signing via an SCN contact. 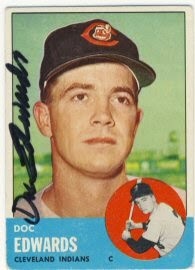 I also received a 1963 and 1964 Topps signed by Doc Edwards. 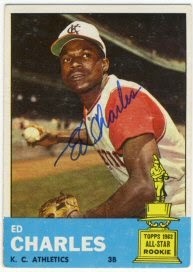 I have sent several requests to Mr. Edwards over the years and this was the first return I have received so I was happy (and a little surprised) to get it. It looks like he's been a pretty consistent signer over the last year, but was pretty spotty prior to that. 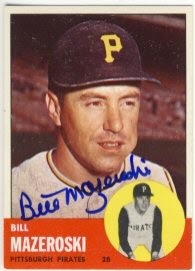 I didn't receive any returns today, but I did receive a Bill Mazeroski signed 1963 Topps that I bought on eBay. 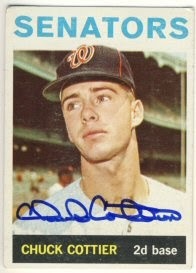 I bought it from the same SCN member that is selling off his 1963 set that I bought about 40 other signed cards from in the last few weeks. 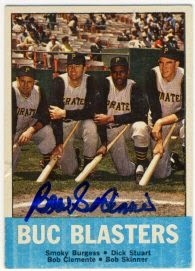 Four more returns today as well as a handful of cards from eBay orders to send out. 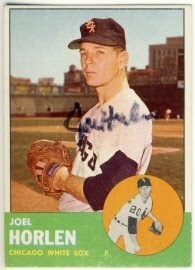 Joel Horlen signed his 1963 Topps. 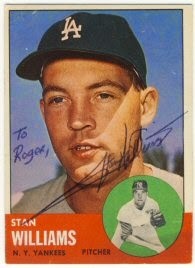 Looks like his pen was running out of ink however. 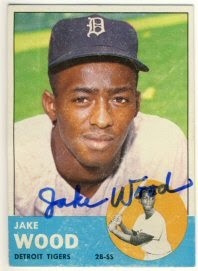 Jake Wood signed his 1963 Topps. 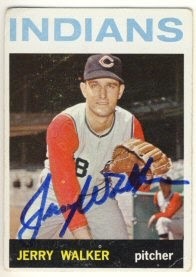 Denny Lemaster signed his 1964 Topps. 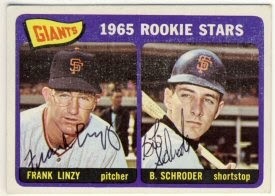 And Frank Linzy signed his 1965 Topps already signed by Bob Schroder. 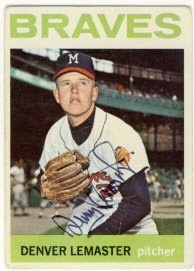 I had this card signed by Linzy only as well, and sent that off to Schroder, so I may end up with two of these. 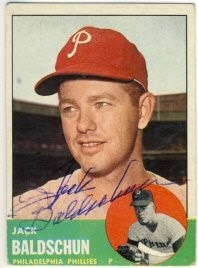 I came home to a nice full mailbox today, including one previously TTM toughie. 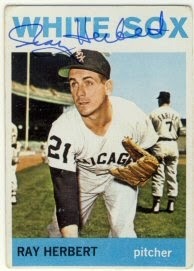 Stan Williams signed his 1963 and 1964 Topps. 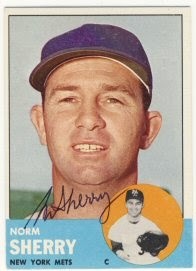 Norm Sherry signed his 1963 Topps. 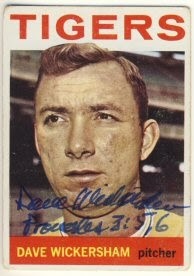 A while ago I went through my signed cards and picked out the multi-player cards that I thought I could get more signatures on. A couple of those came back today. 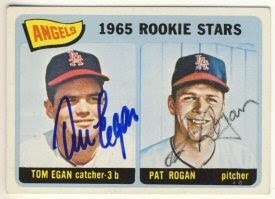 Pat Rogan signed his 1965 Topps already signed by Tom Egan. 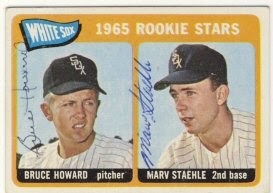 And Bruce Howard signed his 1965 Topps already signed by Marv Staehle. 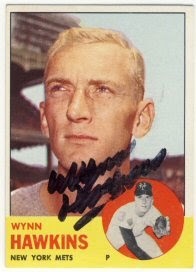 Finally, I received a 1961 and 1963 Topps back from Wynn Hawkins. 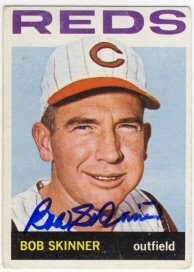 I saw a recent return on SCN with a clue as to the address and was able to get a couple cards back. He also wrote a short note about a game I referred to in my letter and a couple other short topics. A very nice return! I had two returns yesterday. 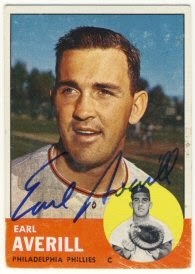 Ed Charles signed his 1963 and 1964 Topps as well as a Ron Lewis 1969 Mets postcard. I've had these postcards laying around a while and my son sent out quite a few several years ago. I'm not sure why I haven't sent out more. 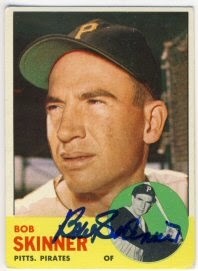 Bob Skinner signed his 1963 and 1964 Topps, as well as the 1963 Topps Buc Blasters card. 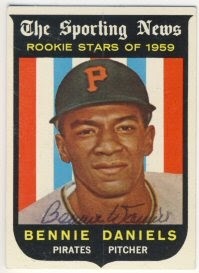 Even in this shape, I had to pay nearly $10 for this card because Clemente is on it. 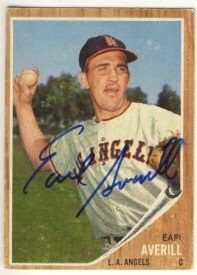 I also received several more unsigned cards on eBay and I hope to get a start on sending out more requests this week.